I have been working on a new computer desk for the kids for quite some time. 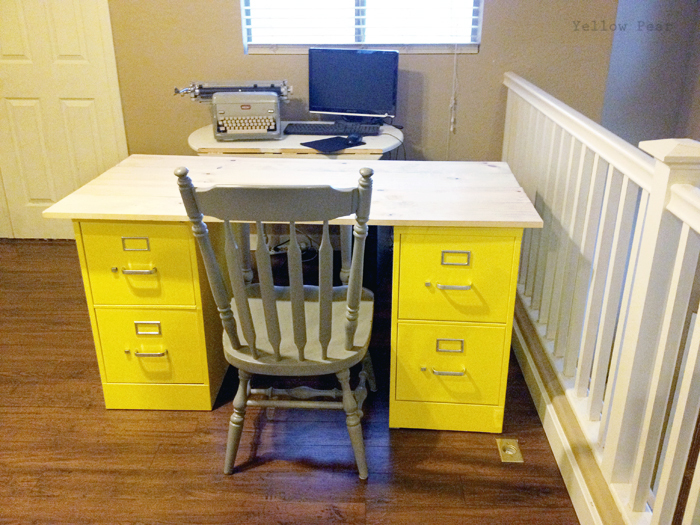 I had one boring black filing cabinet taking up space (but useful for school papers and bills) and so I decided if I found a second to match, I could make a desk and add some storage space at the same time. I scoured thrift stores for awhile with my measurements in hand, and finally found a filing cabinet to match. Which was more difficult than it sounds because I happened to have one that was taller than most of the others I came across. After I found the match, I took the pair outside on our dead grass (yes this was way back in February) and washed them, removed the hardware that came off easily, taped off the rest and applied a nice coat of Kilz Primer. 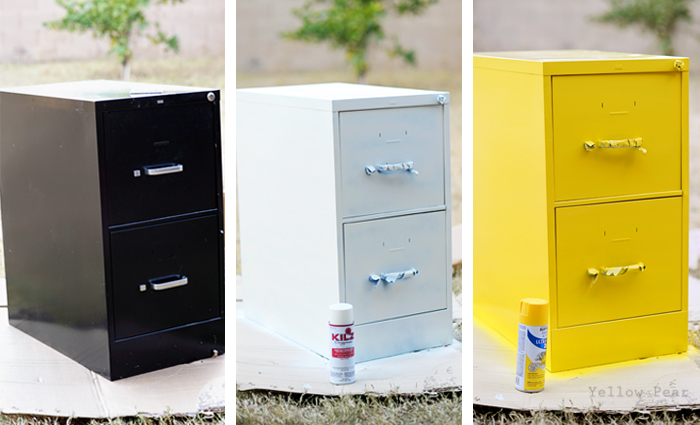 Next up I used a Rustoleum yellow spray paint. I usually prefer Krylon, but I couldn't find a yellow I liked in that brand. For the desk top, I bought some wood planks and had the hubby cut, sand and attach them together according to my measurments. He added wood bracers underneath at just the correct spacing so as to keep the filing cabinets in place...if that makes sense. When we were sure it fit, I stained and sealed and then we didn't even attach it to the cabinets, just laid it down and presto...insta-desk with built in storage. Aweome. Notice the tiny desk behind. Blech. I was so happy to change that out. 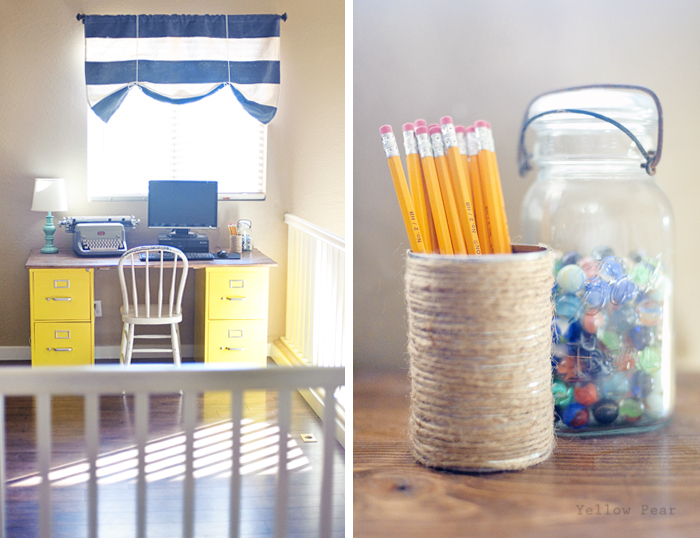 I had a red floral valance above the desk and it didn't work anymore with the utilitarian desk, so I thought and thought and researched and couldn't find a curtain I liked/was in my budget. I finally decided to make my own striped fabric. I had a canvas drop cloth hanging around from another project and washed, ironed and measured it to size. 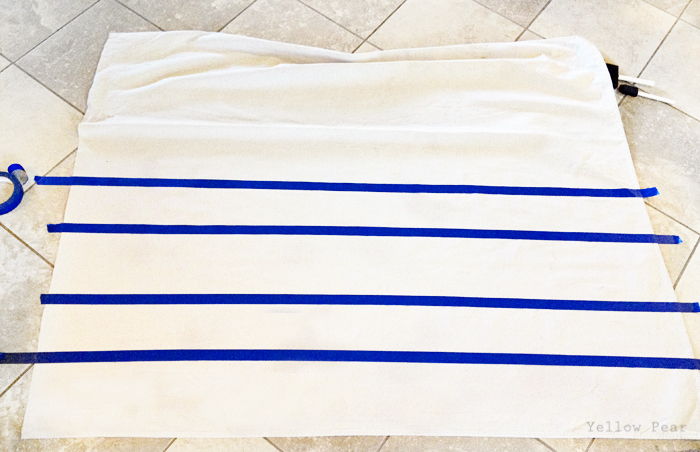 Then I cut it and measured for my stripes and taped them off with painter's tape (remember to tape on the inside of where the white stripe will be). I ran a credit card across the tape to get a good seal and made sure to paint carefully away from the tape to avoid leakage. I just used some regular navy interior paint from my paint collection. I probably should have mixed it with a fabric medium, as it turned out a little stiff, but it works fine for my purposes. I gave it 2-3 nice coats and when it was fully dry, I washed and ironed it one last time. Finally, I sewed a simple curtain rod pocket at the top and hung it up. It was a little longer than I wanted it, so I added rope ties to hold it up. Also, the window is not centered on the wall...it drives me batty. So I just decided to center the desk on the wall and not worry about it anymore. My father-in-law gave me an awesome working retro typewriter, so it sits up there for funsies. 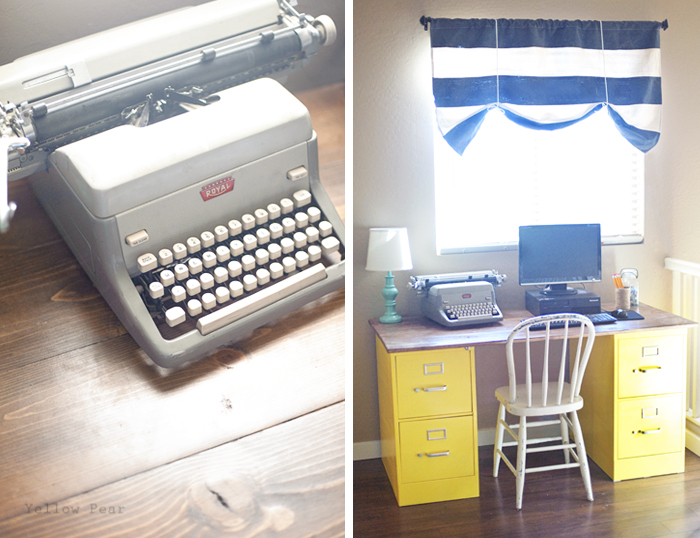 I love it...although it's out of typewriter tape, so I need to find some because it's so fun to type with. I love how the whole thing turned out. Their desk sits up with mine and the antique desk in the loft. It makes me smile every time I walk by.